Greg Jones | The Journal Gazette Retired Virginia Tech coach Frank Beamer speaks Saturday at Wayne High School. 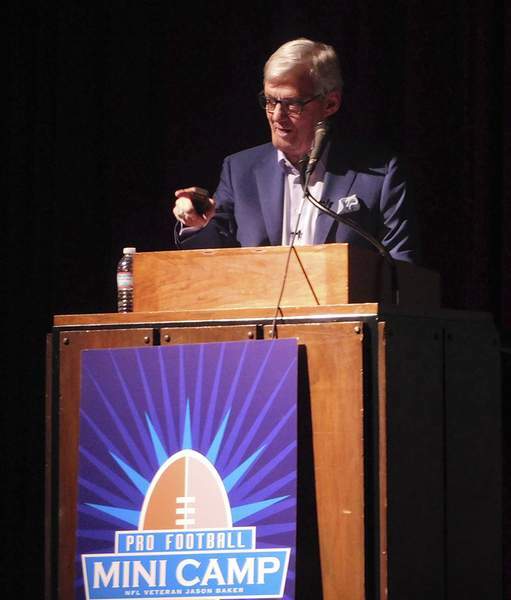 The message that kicked off the coaches clinic for the 10th annual Pro Football Mini Camp on Saturday was delivered directly to the high school and youth coaches gathered in the Wayne High School auditorium. Keynote speaker Frank Beamer, the retired Virginia Tech football coach, delivered a speech about a three-pronged attack for maintaining excellence in a program. Before Beamer took the stage, a panel discussion took place on empowering coaches and, subsequently, their players with "racial empathy through athletics." Beamer, who won 280 games in 35 years, including 238 in 29 years with the Hokies, emphasized the need for integrity, communication and organization. "Whether you are talking about your personal life, your coaching life or your business life, whatever, these three things need to be there," Beamer said. "If they are there, you have a heck of a lot better chance of being successful. I try to live my life by those things." To emphasize his points, Beamer’s speech and presentation included lyrics from country singer Tim McGraw, and as well examples of continuity and consistency in professional sports, including San Antonio Spurs coach Gregg Poppovich, New England Patriots coach Bill Belichick and the Pittsburgh Steelers organization, as well as other professional athletes. In a Q&A session through previously emailed questions from the gathered coaches, Beamer also addressed other topics. Among those were his recent involvement on the 13-member committee that decides the four teams in the College Football Playoff. "Somebody said, ‘do you think they got it right with the four teams (last year)?’ " Beamer said. "I just said after learning how much work (the committee) puts into it ... if they didn’t get it right, it’s not from a lack of effort." Beamer also was asked about the shootings that took place on the Virginia Tech campus in 2007, killing 32 and injuring 17 more. "I said Virginia Tech should be remembered more for how they responded than the shootings," he said. "You don’t want to let one guy define Virginia Tech." Preceding Beamer was a four-person panel moderated by Charles Thomas, a vice president for an information technology company within the intelligence community, that set the tone of integrity with a frank talk about racial empathy and coaches’ influences on their athletes concerning that subject. The panelists were TinCaps President Mike Nutter, former NFL punter and camp founder Jason Baker, Allen County Health Commissioner Dr. Deborah McMahan, and Ivy Tech vice chancellor of student affairs Chris Cathcart. "We are dealing with a very serious subject," Thomas said in his closing remarks. "It is up to each one of the coaches to set that standard in excellence." Throughout the hour-long discussion, the panelists agreed the subject of race and athletics is one that should not be ignored. "We have to hit it head-on," Nutter said. "We just have to talk about it. It doesn’t have to be combative." Cathcart wrapped it up by emphasizing that assistance is always available. "Don’t be afraid to ask for help," Cathcart said to the coaches. "You can’t do this on your own. I bet there are people you work with every day that do the exact same things you do that can help you through this process."